Day 1 You arrive at Lima International Airport where you are recieved by the tour and taken to the Hotel Antigua de Miraflores, a transformed hacienda house from the 19th century. Free time until the evening when we will all go out to dinner to savor the best cuisine in the world at resonable prices! There the guide will lay out the trip ahead of you. Sleep well! Day 2 Will find us flying early (after a great breakfast at the hotel) to Cuzco, the capitol of the Incan civilization, and settling in to our Spanish Colonial Hostel Amaru. It will be important to drink the coca tea you are served upon reception as this will help your body aclimatize to the altitude. Did I tell you that Cuzco is 11,800 ft above sea level? In the afternoon you will be treated to a tour of the Incan capitol, the nearby fortress of Sacsayhuaman and the Incan Baths. You can choose to do this on your moto if you wish. The evening will close with the best burgers in the western hemisphere at Norton Rats Tavern, a famous Round-the-World motorcycle travelers bar and grill. Day 3 You will catch the train early out of Cuzco and travel over the top and down into the Urubamba River Valley. At km 104, you will disembark and begin a spectacular afternoon hike along the last part of the Inca Trail. As you step through the 'Doorway of the Sun' you see below you the famous outline of the lost city of the Incas, the Machu Picchu Sanctuary just as you have seen it in the posters! You will have but a little time to visit the ruins this day, but you will be back early tomorrow. You catch the transport back down to the base of the mountain to the town of Aguas Calientes for the night. In the evening you might want to go to the mineral sulfur hot springs to soak your weary muscles and be ready for a full day tomorrow. Day 4 After breakfast at your hostel, you board the transport that weaves up to the citadel while it is still early. The regular tourists don't arrive until later on the train, so Machu Picchu is relatively quiet. This is your chance to take the trail that will lead you to the top of Huayna Picchu (the green peak behind Machu Picchu) where there is a 360 degree view of the citadel and where the recently found 'Temple of the Moon' is situated. Around 4 pm you are back down at the train station and headed back to Cuzco, arriving about 9 pm. Better get some rest because you start your moto adventure ride tomorrow! Day 5 We head north through the Andes. First we climb on pavement over a spectacular pass with snow-capped peaks in the background, then down past Abancay to the river. Then the gravel begins! We wind up, up, up. Don't forget to look back! An hour later you can still see where you came from! 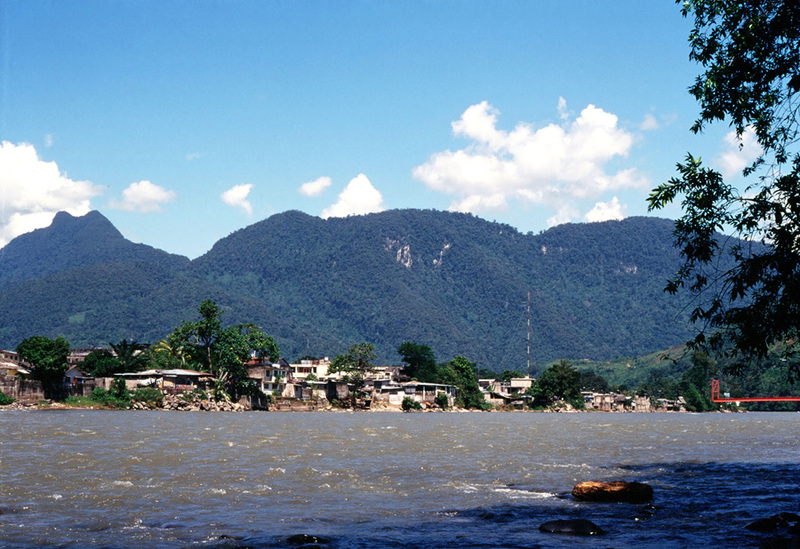 We take a back route that will bring us past the ancient civilization of Sondor beside Lake Pacucha. Just past Sondor and over a small ridge we arrive at our destination of Andahuaylas, a quaint andean city nestled in a tight valley. Days 6-7 Our destination today is Ayacucho. By the middle of today we will have climbed up past Chincheros and Ocro to a high Pampa from where we can see our destination, still 100 km away! There will be two choices of routes into Ayacucho.. do you want challenging mountain short cuts, or some peg-scraping twists and turns cruising downhill? Ayacucho is steeped in history and culture. It is famous for its hand crafts and stone carving. We will stay two nights at the Marques de Valdelirios hostel, an hacienda home built in 1839. Day 8 We continue north from Ayacucho towards Huancayo. First we head up to Huanta, a large town made up of craftsman specializing in weaving and leatherwork. From Huanta we drop into a desert river valley with incredible stratified colors in the overhanging cliffs until we reach the hydroelectric dam from where power is sent 300 km to Lima. If we have time, we will go on an adventurous side route climbing up a little used road over a ridge and down through eucalyptus lined trails into the town of Pampas. From there we continue up the valley past Huancayo, cross the river and up to Hotel Loma Verde with it's fireplaces and colonial architecture. Day 9 This day we will say goodbye to the highlands. But first some incredible riding with tremendous dropoffs and unending views! We leave Concepcion and head up through Comas and up onto the high pampa, passing Laguna Pomacocha at 14,660 ft above sea level, before we drop down into the mountain jungle. The rainy season has just past in the jungle so it won't be muddy, but everything will be lush and green. Twists and turns as we drop through the clouds down a narrow valley, pasts waterfalls and Ashaninka native lands to the Satipo River and the town of the same name. Days 10-11 This will be our first day of riding completely in the mountain jungle. This day there will be bridges over all the rivers, but you still may get wet as the vegetation-covered cliff sides overhang the road at times and water runs down on you as you pass. Our destination today is the German colony of Oxapampa. Although this town has been in existance since 1891, the Austrian culture is strong! As we drop into the jungle valley, the first thing you notice are the wooden A-frame homes with flower boxes in the windows and holes in the eaves for the pigeons to roost (it's for good luck!). The valley is replanted in pines. Sheep and cattle dot the hill sides hemmed in by split rail fences. Are we really in the Amazon?? The food here is SOO GOOD that we will spend a rest day here! In fact our hostel sits within the grounds of the best grilled meats restaurant in the country: ITALO'S ! After lunch wander on down to the town square and check this out. Chances are you will come across folks in cultural dress! Day 12 Maybe you saw only one way into Oxapampa, but we will take a back trail out, to the east, over the ridge to Villa Rica. Hugging the narrow jungle ridge we will have some great views below to the Amazon watershed. This is a favored section for many riders as it requires many rocky river crossings. Hostal Humbolt on the edge of Puerto Bermudez is quite a place, run by a Spaniard named Jesus. Hammocks line the entry way into the hostel beside the Pachitea River. Jesus will whip up us one of his famous suppers to add in our welcome! Day 13 Leaving Puerto Bermudez, we follow the Pachitea River north, past Puerto Inca to the central trans-andean road in the lower eastern jungle and turn west, back towards the mountains. We continue through the hilly jungle, as the sun sets behind the Andes ahead of us. Crossing one of the longest suspension bridges on the continent, we enter the town of Aguaytia. Situated beside a large river, and with waterfalls around every corner, the name Aguaytia ("the place of waters") seems very apropriate. Tonight we will go out on the town to try some of the best dishes the jungle area of Peru has to offer, for tomorrow we will climb back into the highlands. Day 14 This is a special day, as we will spend most of the morning at the Boqueron de Padre Abad, a wilderness national park of waterfalls, orchids and wildlife. The main falls is over 400 ft high, cascading down a rock face and into a 50 ft crystal clear pool. Don't forget your suit! In the afternoon we continue on up the jungle gorge to the pass into the highlands, passing Tingo Maria and the famous 'sleeping beauty' profiled along 4 miles of jungle ridge. The cloud enshrouded tunnel at Carpish takes you from one distint region to another. From the top we wind down to Huanuco, the 'city of eternal spring', nestled in a valley at 6,000 ft where there is always a temperate climate. Tonight you will catch the tourist bus over the Andes to Lima, but before that we will celerate the end of the moto adventure portion of the trip with a local feast. The meat and vegetables of the Pachamanca are cooked for 8 hours under the ground, heated by stones taken from a fire. Day 15 You will arrive in Lima on the tourist bus at 6:00 am in the morning, but rested it is a bus/cama with room to stretch out and sleep. Sometime in the night you will have passed over Ticlio, the 15,800 ft pass. There IS the option of flying back to Lima also. As you arrive, you will be met by our staff to take you to the hotel where you will have the use of a room until your flight leaves later that day. It is hard to believe that you have experienced SO much little time!